Many of us are aware of the heating power of the stove, sitting in front of a lovely warm stove with the warm glow coming through the glass and coating the room in the picture postcard glow. However, when heating a larger room you will probably find that the area around the stove is lovely and warm, while perhaps just a few feet away on the other side of the room the temperature drops dramatically. This is because of poor air circulation, there is nothing wrong with the stove, it's doing exactly what it's designed to; heat the space around it, but the heat isn't moving around the room. This is where this accessory comes in, this little fan sits on the top of the stove near the rear and using the heat coming from the stove simply spins the blades and blows the warm air around the room, capable of moving around 100sqft of air per minute this stove fan ensures you room is a constant temperature with no cold spots. The amazing thing about this stove fan is also that it is fully automatic and requires no electricity or external power supply, it is simply powered by the heat from the stove it is sat on, this means better air circulation which heats up the room quicker allowing you to adjust the burn rate of the stove and save you fuel! 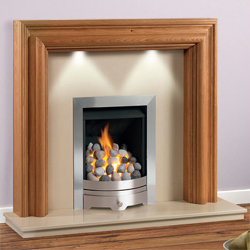 These fires essentially are the same as the conventional flue standard fires, with one major difference. Instead of an opening in the top of the fire to allow the fumes to vent through up to the chimney or flue, it has a high pressure extractor positioned on the exterior of the building. This means rather than the passive draw of heat movement up the flue you have a powerful fan sucking out the fumes as well as some of of the heat. Most Power Flue fire (otherwise known as Fan Flue Fires) quote a similar efficiency to open-fronted conventionally flued appliances of 50-60%, however powerflue fires do also require an electricity supply. These fires have a slightly higher running cost that that of a balanced flue or conventional appliance, due to the extractor fan on the outside, because of this several UK manufacturers have now stopped producing these models. But if you want that real open flame look, without a chimney then the only way is a powerflue appliance. There is one product on the market which has a very unique feature, not only is it 60% efficient it has a draft barricade appliance on the exterior, contained within the fan flue. 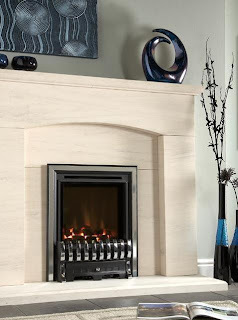 The Apex Clarkdale Draft Barricade Power Flue Gas Fire, actually shuts the opening through the wall when the fire turns off, this reduces drafts, increasing the efficiency of your home, so for those whos only option is a Powerflue this is the fire to look at. Light emitting diodes to the tech savvy, typically these bulbs are high tech while being very strong durable and with an extraordinary lifespan. White LEDs quickly matched and overtook the efficiency of standard incandescent lighting system by some distance, while standard bulbs work at around 16% efficiency, measured by its light output per unit power input, LEDs work at around 90%. Typical lifetimes are 25,000 to 100,000 hours, this is either 11 years of non-stop operation, or 22 years of 50% operation. The long operational life of a led is a vast contrast to the standard life span of an incandescent bulb, which is around 5000 hours. This means less changes and more value for your money. A brilliant example of how LED bulbs can make a fire look realistic is the Apex Rio and Rio Grande which use unique LED technology for low energy consumption using only 15 watts which is less than a average light bulb! 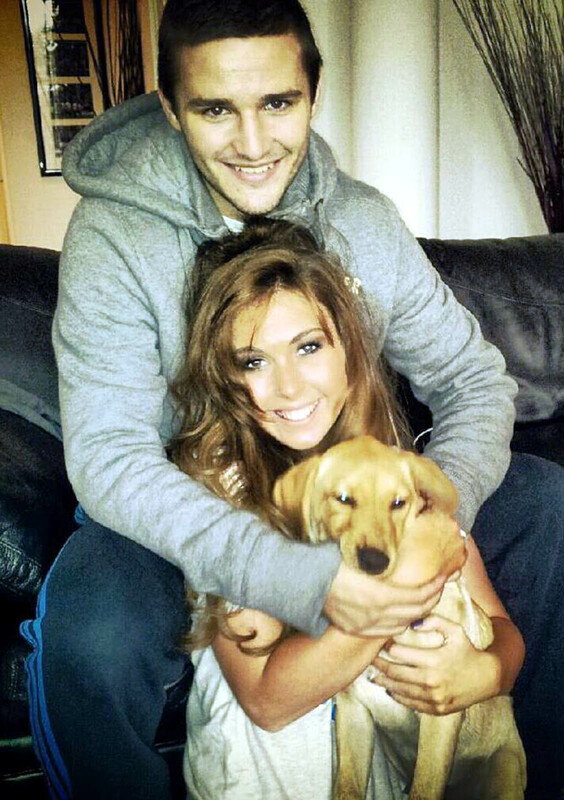 Stoke City's Jamie Ness and his model girlfriend Heather Weir say they owe their lives to their pet labrador after his strange behaviour prompted them to call in engineers. They could not understand why their normally active dog Alfie suddenly wanted to sleep all day. Investigations eventually revealed that the couple's Aga cooker was leaking lethal carbon monoxide gas that could have killed them. One-year-old Alfie was sleepy because he was being slowly poisoned by the colourless, odourless gas. Weir, 22, said: 'Without his strange behaviour Jamie and I would have went months not realizing what was leaking into our home. 'I love him so much and I'm so thankful to have such a wonderful companion - he saved our life.' 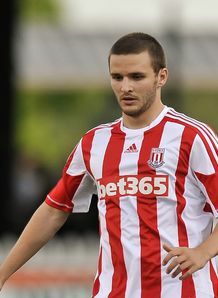 The 21-year-old midfielder moved from Glasgow to a new home in Cheshire with his girlfriend in July when he left Rangers for Stoke. He is yet to play for Tony Pulis's team in the Barclays Premier League but has represented Scotland through the age groups. After noticing a strange smell, Heather had the stove checked and discovered it had been serviced and passed that month. However, she said: 'Within the past four weeks, Alfie was sleeping all day. He had stopped playing with his toys and was just very lethargic.' After returning from a family trip to the United States, Heather noticed Alfie was getting worse. She said: 'He just wasn't right at all. Usually Alfie would be up and down like a yo-yo pestering me to play but instead, he went up to our room and slept for five hours.' Heather had experienced a few brief moments of sickness but Jamie did not show any symptoms at all. Determined to get the bottom of Alfie's strange behaviour, she called an engineer out to the home who immediately realised what was happening. He told the couple that if Heather had not picked up on Alfie's sickness their exposure to the carbon monoxide leaking from the stove 'could have been fatal'. Carbon monoxide poisoning claims the lives of around 50 people a year in the UK. Stephanie Trotter OBE, president and director of CO-Gas Safety who raise awareness and publish data of CO deaths and accidents, said that carbon monoxide prevention needs a “belt and braces” approach. She said: “Firstly, well done to the dog and well done to the girl. “Often our dogs, cats and other pets are more susceptible to the gas because of their smaller lungs and weight. “That’s why miners used to take canaries down the mines – if they stopped singing you knew to get out because there was CO present. The RSPCA said pet owners should be more aware of their pets’ behaviour. A spokesman said: ”This demonstrates the importance of pet owners being aware of their pet’s normal behaviour and of being observant. Paul Johnston, chief executive of Gas Safe Register, commented: “The couple involved in this incident had a lucky escape, but tragically others are not always so fortunate. “Carbon monoxide is a highly poisonous gas. You can’t see it, taste it or smell it and without an adequate supply of fresh air, it can kill quickly. “The symptoms are also very similar to flu, which at this time of year is worrying if people get the two confused. Alfie’s poison scare comes at the same time the Royal Society for the Prevention of Accidents (RoSPA) and Gas Safe Charity extended a carbon monoxide awareness programme to Scotland. Around 10,000 families in the UK will benefit from receiving a free CO detector aiming to prevent any dangerous leaks. Jennifer Henderson, home safety officer for RoSPA in Scotland, said: “It is important to equip yourself with the knowledge of what carbon monoxide poisoning is, why it is dangerous and how to prevent it. The Met Office has already briefed the government to prepare for a colder than average winter, with temperatures expected to drop significantly at the end of November, at which time ice and frost are likely to cause transport problems and there will be a significant risk of heavy snow. While many consumers have already upgraded their heating system during the initial cold snap, it may very well be worth upgrading that tired and inefficient open solid fuel or gas fire with a more efficient fire or stove that will keep you warm when the weather outside is cold and snowy. 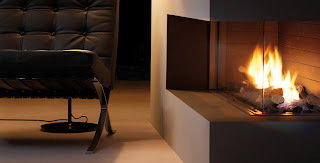 Fires such as the Apex Capacious HE or Verine Orbis High Efficiency boast heat outputs that could have only been dreamt of by older gas fires and efficiency ratings of up to 89% that mean you certainly won't be cold sat in front of one of these gas fires. Better yet, with remote control you can turn on the fire and turn it up and town from the comfort of your armchair, the days of getting on your hands and knees to fiddle with the controls behind the fret are over. Both of these fires are available with a number of styles of trim and fret making them suitable for items ranging from the most contemporary to very traditional fireplaces and living spaces. 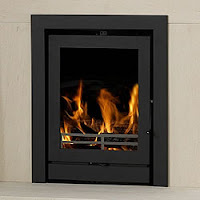 For those looking to replace a solid fuel grate, but not wanting to close up their open fireplace for an inset fire or not wanting to put in a gas connection, then a stove is a perfect alternative. 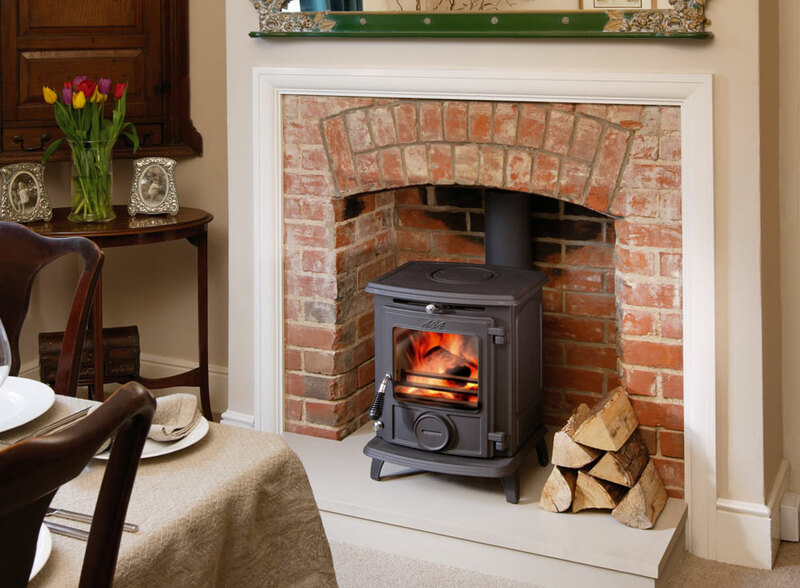 While an open fire often sends a vast amount of its heat straight up and out of the house, a stove can boast efficiencies of up to 85% and dramatically reduces the amount of heat loss. Stoves have also come a long way from when they were once simply just a metal box with a fire in, carefully designed airflow and baffles mean that the stove burns it's fuel almost completely, meaning there is very little ash when the fire has died down. The other advantage of a stove is the body itself, whether iron or steel, it will hold some of the heat from the fire well after the fire has gone out, meaning you basically get an additional radiator for a few hours after the fire has gone out. Perfect for those long chilly nights just before you go up to bed. Some of you experience power outages over the last few days, or you know someone who did. It is no fun when you experience an unexpected power outage, but it is worse when that power outage means no heat. Gives you heat when you have no power. Winter can mean unexpected power outages all the time. Stay warm even when you have no power. 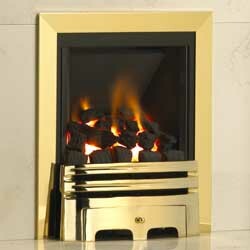 New from Costa Fires is the Berkely Electric Suite, this modern, textured stone suite comes complete with electric fire. 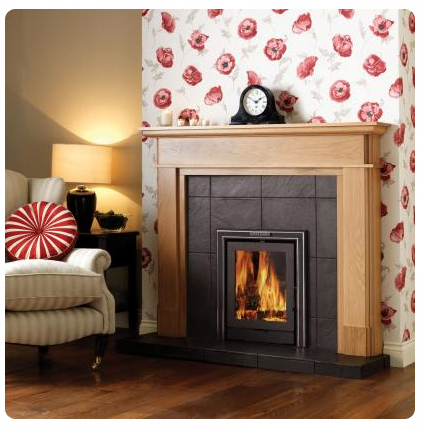 This new suite rivals that of the Dimplex Chadwick or Bemodern Stanton, combining a well styled stone effect fireplace surround with contrasting black hearth and large electric fire in the centre. 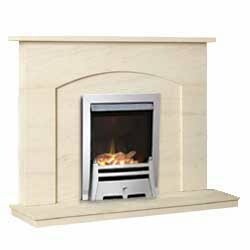 The Berkely features an ultra-low energy LED flame effect and realistic log fuel effect to create a truly homely feel and is supplied fully assembled for ease of installation as it simply requires plugging in. Featuring an automatic thermal cut-out for safety, this electric suite would look stunning in almost any style of living space, contemporary or traditional, the clean lines of the fireplace focus your eye onto the fire in the centre. With Costa producing more and more stunning electric fires, expect to see theses fireplaces in living spaces up and down the UK in the very near future. Public awareness of the dangers of carbon monoxide (CO) poisoning needs improving and more campaigns targeted at this group are required, according to research by the Gas Safety Trust. The study was carried out by the Safe & Healthy Housing Unit at Warwick University, on behalf of the fuel safety charity, to evaluate the effectiveness of CO campaigns on public sector tenants. Alarmingly, 47% of those interviewed did not know the telephone number for the emergency services and only 1 in 10 could identify the colour of a gas flame that could cause danger. Campaigns on CO awareness and gas safety were carried out between phase 1 and phase 2 of the research. While the level of knowledge before the campaigns was found to be average, with around 70% positive responses, the research findings revealed no increase in CO awareness among public sector tenants as a result of the campaigns. As the level of awareness had not reached the 80% considered high enough for sufficient public health protection, the report suggests that the campaigns were not sufficiently effective. The survey report recommends that more CO awareness campaigns are necessary, that they need to be targeted towards specific vulnerable groups, and their effectiveness should be monitored. Gas Safety Trust board chair, Chris Bielby said: “As well as targeting campaigns for specific audiences, monitoring will help ensure that the CO campaigns are informing and influencing the intended audiences. He added that ideally, all public sector dwellings should be fitted with working CO detectors and residents made aware of them. CO awareness week begins on 19 November, with events across the UK. The free CO Awareness smartphone app is now available to download, for Android devices only, to give people information to help protect themselves from the lethal effects of carbon monoxide. Cosying up in front of life's pleasures during cold weather - and those flickering flames bring a room alive. Nowadays there's no need to feel left out in the cold if you haven't got a chimney - after all it never stops Father Christmas! - there are fires to suit every home. 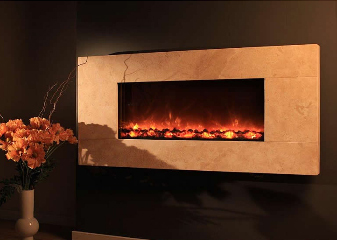 Designer's recognise that fires are often the focal point of any living room and have worked their magic to create traditional fireplaces and innovative solutions for homes without a flue. A fireplace or stove is often the natural focal point of a room in autumn and winter and furniture is often pulled towards it. "A fireplace can be an eye-catching centrepiece which transforms a room" Says Paul Chesney of Chesney's. "Many customer are deciding to improve rather than move and want to use a fireplace to improve their living space or bring a new style to their home." Take care choosing the fireplace surround, he advises, so that it suits the room and its proportions. "You don't necessarily have to go for a design which matches the age or period of the house" he says. "Instead, be guided by your decorating scheme. Choose something you find attractive, but do take into account the ceiling height, room depth and chimney breast width." Toasting your toes in front of an open fire has always been one of the best things in life, but these days you can get the effect without all the effort associated with burning coal or solid fuel. Gas fires look so good these days it is often hard to tell they're not real. Or if you haven't got a gas connection you could simply plug into the world of electric fires, which has been transformed since the days of the soulless two-bar fire. The recent icy winters and steep hikes in fuel prices have triggered a huge surge in the popularity and demand for stoves. It's hardly a surprise really because wood burning stoves in particular are so eco-friendly, visually appealing and efficient. While a traditional open fire is estimated to throw about 20% of it's heat, some of the latest stoves claim to generate upwards of 75% efficiency. 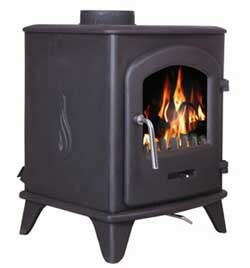 One big advantage is that stoves don't necessarily need a proper, brick built chimney. They can be installed virtually anywhere in the home, either on an outside wall or through the centre of the house. But don't forget to check if you live in a smoke control zone as there may be restrictions on what you can burn. Under the Clean Air Act local authorities may declare the whole or part of the district of the authority to be a Smoke Control Area. It is an offence to emit smoke from a chimney of a building, from a furnace or from any fixed boiler if located in a designated Smoke Control Area. It is also an offence to acquire an ‘unauthorised fuel’ for use within a Smoke Control Area unless it is used in an ‘exempt’ appliance (‘exempted’ from the controls which generally apply in the Smoke Control Area). These appliances are generally referred to as ‘DEFRA Approved’ or ‘Smoke Exempt’ and must be operated at all times in accordance with the manufacturer’s instructions, which have also been scrutinised during the authorisation process. Smoke Control Areas, or Smoke Control Zones as they are sometimes referred to, have been designated by local authorities in many towns and cities in the UK, including virtually all of London, Manchester and Belfast. The North West, Midlands, South Yorkshire and North East of England as well as Central and Southern Scotland, all have large designated Smoke Control Areas. If you live in a UK Smoke Control Area you must only burn ‘authorised’ smokeless fuels. In such areas burning wood is only ‘authorised’ if you burn it in a Smoke Exempt stove. Even when using a Smoke Exempt stove, you will still be breaking the law if you use wet or unseasoned wood which causes excessive or nuisance smoke. Further information on the requirements of the Clean Air Act can be found at: www.smokecontrol.defra.gov.uk. Only ever use dried, fully seasoned (or kiln-dried) chopped wood logs with a moisture content of less than 20%. Wood which is well seasoned makes a distinctive ‘clack’ rather than a dull ‘thud’ when knocked together. It will also feel much lighter than an unseasoned log. Other indicators of a well-seasoned log include bark peeling away and cracking and splitting around the outside. Ideally wood should be seasoned outdoors for between 18 to 24 months – the harder the wood then the longer the seasoning. It should be stacked off the ground with plenty of space between the logs to allow air movement and with the top covered to keep rain and snow out. Seasoned wood will give you approximately 50% more heat output than the equivalent unseasoned log. Most types of hardwood, for instance Ash (generally regarded as the best), Birch, Beech, Oak and Elm can be used. However, avoid woods with a high resin content. As a rule of thumb, the heavier the wood, then the greater the heat output and the longer burn time – the time between refills. All of this is providing it is fully seasoned wood. Never use wet or unseasoned wood, sometimes referred to as ‘green’ wood, as this will cause nuisance smoke and a very disappointing fire. It could also quickly result in the build up of soot and creosote in your flue system or cowl which, because of the higher temperatures of stove flue gases, could easily cause a flue or chimney fire. In addition, burning wet wood creates other environmental problems, a less efficient fuel economy. It will also reduce the effectiveness of the stove’s Airwash system thus causing staining and blackening of the glass. Manufactured or finished wood products, such as plywood and chipboard, are not ‘authorised’ and must also be strictly avoided. The high chemical adhesive or varnish content used in their production could also leave harmful residue inside the stove and flue system. For more information about wood fuel visit the DEFRA funded National Energy Foundation website Logpile atwww.nef.org.uk/logpile or Hetas at www.hetas.co.uk. Any fuel which is not specifically authorised is prohibited in a Smoke Control Area. Burning prohibited ‘fuels’ is an offence in a Smoke Control Area and could create nuisance smoke (this is also an offence in non-Smoke Control Areas). Burning the following ‘illegal’ materials could also damage your stove and flue system, as well as render the product warranties on the stove and flue system components void. Petroleum Coke Never burn petroleum coke as this burns at a very high temperature and its continued use will almost certainly cause irreparable damage to components such as the grate, baffle plate and fire bars. Bituminous House Coal is not recommended because it produces excessive soot deposits, which is not good for the environment, and also considerably increases the need for cleaning the stove and flue system. Household Rubbish Printed matter (excluding very small amounts of newspaper for starting the fire), plastic, rubber, lacquered or impregnated wood, plywood, chipboard and household rubbish, such as milk cartons, should also be avoided. During combustion some of these materials may develop substances which could be hazardous to your health and be harmful to the environment. Flammable Liquids Never use methylated spirits, petrol or other highly inflammable liquids for lighting the fire as these could cause an explosion in the confined spaces of the fire-chamber. Finally, never treat your stove like an incinerator whether you live in a Smoke Control Area or not. Flamerite Fires has launched a new range of cast aluminium products which it says offer "a touch of high quality Victoriana" The Tennyson, Larkin and Somersby Casts are available under Flamerite's retailer only Essence Brand and can only be purchased from showroom locations. The models are designed to be fixed to the wall with all the service work done from the front, meaning they can be installed and used with existing stone or marble surround. Alternatively, they can be paired with one of the floor standing suites from their Gentle Heritage range - The Grand Corbel, Petit Corbel or Aubade. 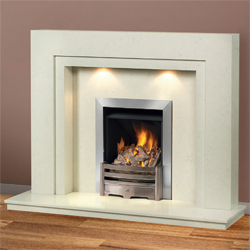 A new 'Starlight White' colour finish has been introduced for these suites and they come with a granite effect hearth. All of the suites feature a multi-function remote control that allows the fuel bed and flame effect to be dimmed independently of each other and the option of a realistic fuel bed flicker. All of the casts are available with either a log or coal effect and produce a powerful 2kW heat output, courtesy of a fan heater hidden under the canopy of the cast. Commenting on the new range, Flamerite's technical director, John Watts said: "We're aiming to reflect the mood of the market. Casts and Stoves are surging in popularity. Perhaps it's because of the challenging economic conditions, which are making people feel nostalgic for the past, or perhaps it's because if people are going out less, the comfort of their home is more important to them than ever. Whatever the case, we are here to help retailers meet demand for high quality products at good prices, which look good in the home"
The type of wood you burn in your stove makes a big difference to the heat output and look of the fire as some woods burn more brightly, cleanly and for longer than others. With the clocks having gone back and winter officially here, now’s the perfect time of year for beginning to light a fire in your wood burning stove on a regular basis. You naturally want to maximise the heat you get from your logs so it’s worth spending a bit of time contemplating the type of wood you use to make the fires in your burner. Real fires add warmth and charm to a home, and there’s something so magical about gathering around the hearth on a chilly evening. When you combine this with the environmentally friendly nature of wood burning stoves thanks to their energy efficiency, using a stove to boost your heating system makes financial sense too. And there are ways you can make the most of your stove’s potential by sourcing the best wood types. As a guide, always avoid damp or unseasoned logs as not only will these create a visually displeasing fire with dulled flames but much smoke will be released and heat lost as the water content in the wood is burned away. This means you’ll lose a great deal of the log’s heat potential as well as the look of the fire itself. So always choose dry wood that has been seasoned well. Also, try to buy hardwoods as these take longer to burn compared to softwoods and because of their density you can pack them into your log shed more easily too. Hardwoods take a little longer to get going than softwoods, which is why you may want to use a softwood variety for kindling and to get the fire started before switching to the likes of oak and ash for a steady heat output. Although larch and pine both burn well and with a bright flame, these wood types tend to spit and leave an oily residue in the chimney so are best to avoid. This wood provides a nice steady burn and generates a good amount of heat. Because of its naturally low water content ash can be burned when it’s green although it’s best to season it first as you’ll get more heat in return. Ash can be easily chopped into logs too. When properly seasoned, oak is just about the best wood for burning as it gives off a consistent heat throughout the burning process. This provides a nice warm glow of heat and creates a lovely scent too. This wood has a naturally high water content but will burn steadily once seasoned well. This wood provides a good heat output and nice aroma. A good firewood, hawthorn releases a nice amount of heat and burns at a slow pace. Reliable and slow burning, maple makes a good choice of firewood. This wood burns well and steadily too for a decent heat output. With all variety on the market and the relatively small size of the industry, often many potential customers do not know of the main manufacturers on the market and fall back on local DIY chains that will sell an 'off the shelf' item without any real technical knowledge and may end up with a product inferior to their needs. 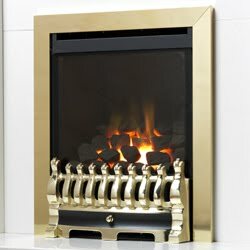 With Orial Fires, you can be sure you are purchasing a high-quality item, whether its their incredible popular Orial Devotion with LED flame effect and backlights, designed for hang on the wall fitting and offering a powerful 2kW electric fan heater with thermostat. Or the larger Robina that is available in either 36inch or 42inch width. Both these fires come with remote control as standard, affording you the luxury of being able to control your fire from the comfort of your armchair. Or for those looking for a more traditional finish, Orial offer the Crete and Athens limestone fireplace surrounds, made from Solid Natural Portuguese Limestone, these fireplace surrounds feature a standard opening for most gas or electric fires and offer that beautiful natural stone feel, without having to shell out large sums of cash. Overall look out for the Orial brand and just bear in mind the incredible quality that these fires stand for. With more and more manufacturers turning to minimalist hang or hole in the wall appliances there seem to be fewer and fewer new fireplaces on the market, which is a shame. However all this changes with Formosa Fires, who have released a new range of fireplace surrounds, designed for modern living. The first surround we are going to showcase to you today in the Paisley, this contemporary fire surround is made from Solid Oak and features attractive downlights to highlight the fire inside, available with either a Marfil Stone back panel and hearth shown left or with a Black Granite hearth and back panel that would beautifully contrast a chrome fire. The Paisley fireplace comes as standard with an adjustable rebate of 25/100mm to accomodate even some of the deepest electric fires and would look perfect in either contemporary or traditional surroundings. The next surround we come to is the Formosa Prestwick, a stunning Branco Veois micro marble fireplace with matching hearth and back panel, suitable for use with most gas and electric fires. The contemporary finish and strong lines on this fireplace make it ideal for the modern living space, while the downlights add that extra touch to really make this fireplace a focal point. 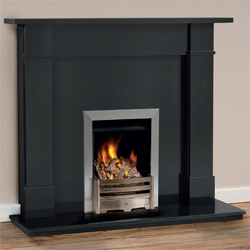 Finally we have a look at the Formosa Saul fireplace surround, a stunning Black Granite fireplace surround that bucks the trend of the large number of light marble coloured fireplace surrounds on the market. 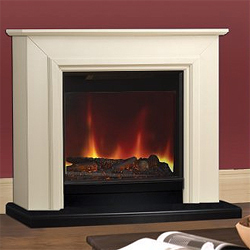 This 54inch fireplace surround is certainly majestic and with a standard cut out would be suitable for most gas or electric fires. These fireplaces are certainly stunning, with the Saul coming into a marketplace dominated by light surrounds and could become one of the most popular fireplaces of this heating season.